While reports continue to comment on bank branches, the fact is, bank branches aren't dead. Not by a long shot. But, as you have seen by the recent flurry of ads for "new concept" branches like Capital One Cafes, branches are in the midst of a transformation. Much of the reason for transforming bank branches is the rapid evolution of technology, which is changing consumer expectations. Customers want it now, at the touch of a button. And a new generation of ATMs is poised to help banks offer higher-tech experiences to their customers. What will the branch of tomorrow look like? Fewer tellers, open floor plans, comfortable seating areas and self-service equipment. There may be a concierge working during regular banking hours to help customers navigate to the self-service option they're looking for. ATMs will be the star of the show in these new branches, providing customers with almost every option they need. At Cummins Allison, we're poised to help you take your branch into the future of banking and beyond. According to a recent Cummins Allison survey of banks and credit unions, reported on by ATM Insights, financial institutions are increasingly focused on ATM capabilities to help in branch transformation. 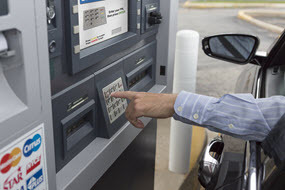 In addition, as institutions replace aging ATMs or expand their current ATM fleets, many plan to explore installing ATMs with new high-tech capabilities. What might this new fleet of ATMs offer? If your fleet of ATMs is aging, it's time to look to the future for the good of your branch and your customers.